What a simple and pure joy, to be on the sea. The sun on your skin is cooled by tradewinds and occasional seaspray. The movement of the boat on the water is ultimately both exciting and soothing. 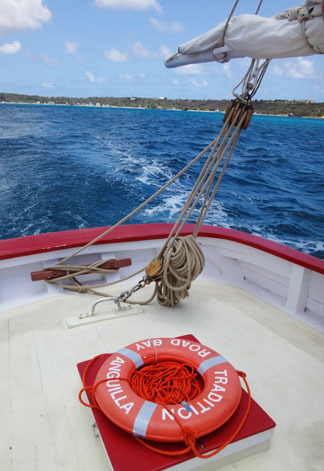 If you are fortunate enough for a traditional Carriacou sloop to be your boat, then you are also treated to the crisp sounds of the sails and the charming sounds of a wooden boat at work… doing what it was designed and lovingly built to do. 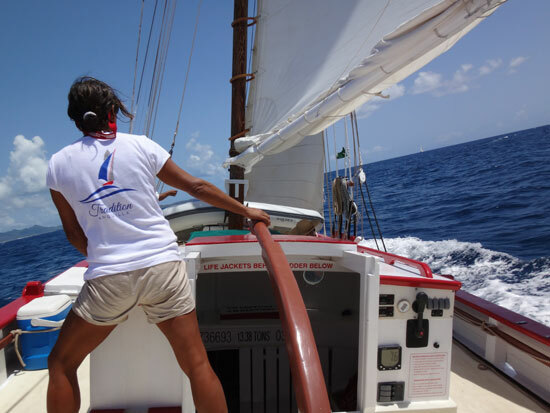 One last cherry on top: If you get to the be on such a historical sloop and the crew is a family of sailors that span generations, whose home port is the special Caribbean island of Anguilla, then you feel a bit like a guest of Anguilla sailing royalty. 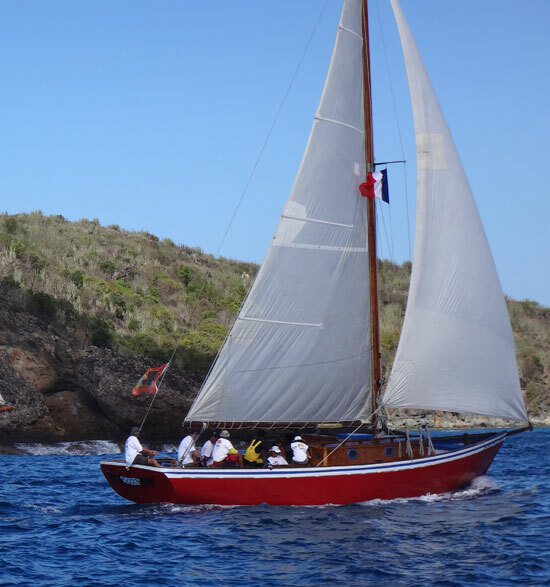 This very scenario was an opportunity that I had in early May… sailing with the stellar crew of Tradition from Sandy Ground, Anguilla to Gustavia, St. Barths where the sloop was entered in the 6th Annual West Indies Regatta. 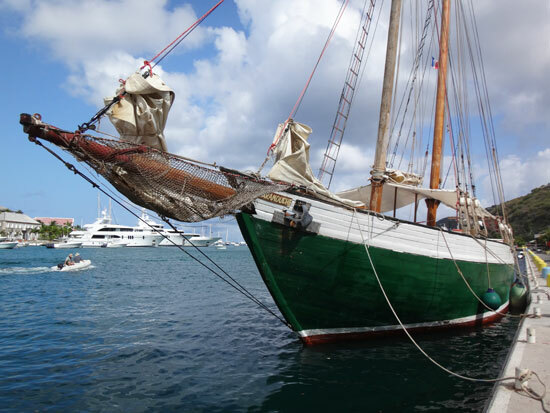 On a Thursday morning, we loaded the boat with our luggage, coolers full of food and drinks as well as boxes of goods made in Anguilla to sell at the regatta's market. Then we set sail, enjoying the coastline of Anguilla as we departed, which was around noon. 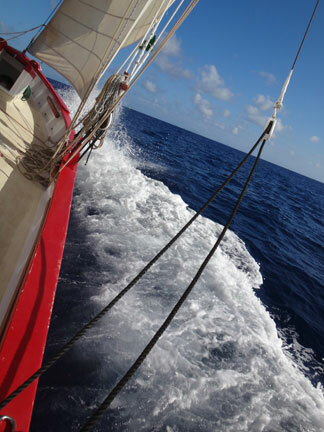 We sailed west out of Anguilla and made our way south and southeast, past St. Maarten, en route to St. Barths. 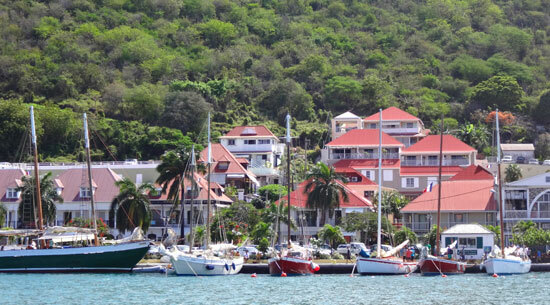 serene as we sailed in to Gustavia's harbour. 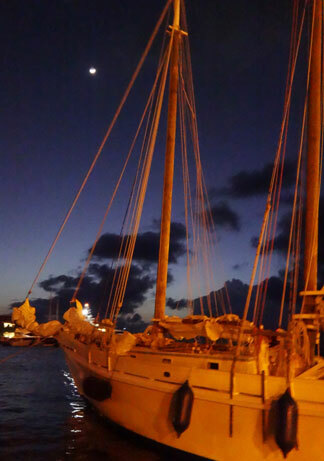 Arrival in the port of Gustavia was magical. 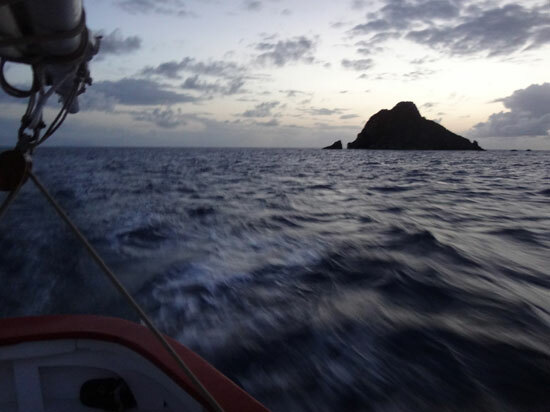 We'd been sailing since mid-day and the sun had gone down as we approached St. Barths. It had been a windy voyage but the wind had calmed, leaving everything still and peaceful in the romantic post-sunset glow. In the twilight we glide up to (tied one after another as you enter the harbor), the majestic, bobbing wooden boats. All sterns within a leaps-distance from the wharf. We tie up between the sloops Summercloud and Zemi. Summercloud's crew and friends were well on their way to a casual on-deck feast of freshly caught fish and some fruits and cheeses. The firelight from under a rastaman's clay yabba pot is flickering nearby on the wharf as he cooked his ital meal. 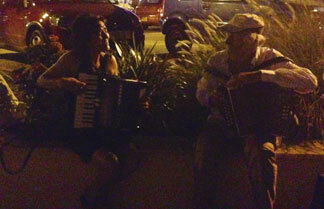 A woman's voice glides through the air as she sits alongside the boats playing her accordion and singing romantic songs in Portuguese. It felt warm and fuzzy like the happy ending in a storybook and it was all just getting started. This St. Barths approach felt very different to the one I had experienced with Nori during our day trip from Anguilla to St. Barths on Calypso. St. Barths is a high-end, luxury, villa-laden island with a European feel conflicting ever so often with the rhythm of the Caribbean in its own unique way. Gustavia is usually only decorated by its yachts, chic boutiques, designer retail shops, upscale cafes and restaurants and many magazine-fresh looking people. My hosts explain to me that this different feel is the presence of the regatta participants and all they bring with it. It certainly was a warm reception from St. Barths given we (the regatta crowd) are not the typical or targeted St. Barths visitors. One other atypical contrast and an arrival bonus worth mentioning was the presence of the racing boats from the Transat AG2R La Mondiale competition. The timing was perfect, as they had just finished their Transatlantic race beginning in Concarneau, France and ending in St. Barths. 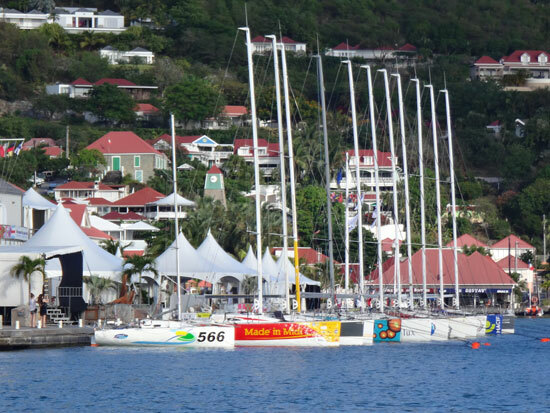 Those tidy racing boats were also lined up along the inner harbor wharf in Gustavia, near where the regatta's UNESCO Artisinal Market would be held for the following two days. After taking in the amazing night scene, we unload what we need from the boat, dinghy it and ourselves across the harbor in two trips and settle in to what will be our apartment home for the next 5 nights. 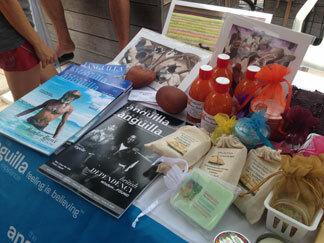 On day two of the West Indies Regatta, the UNESCO Artisanal Market opened. 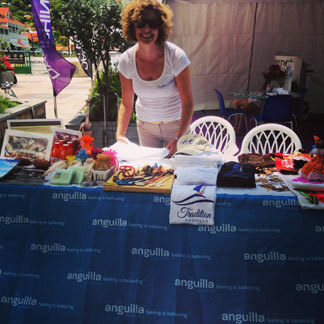 Prior to leaving Anguilla, Tradition's crew had gathered a variety of goods that were made in Anguilla along with the new beautifully logo'd Tradition shirts, to sell at the market. We set our table up alongside tables representing Antigua, Dominica, Grenada, Tortola, and St. Martin. The Anguilla table offered handmade lotion bars, soaps, jewelry, dolls, hand towels, Rockfield hot sauce and Lynne Bernbaum prints. Also displayed for passers by to take were the magazine's Design Anguilla and True Anguilla. Anyone making a purchase walked away with a sharp official "Anguilla" tote bag in either of the two colors from the Anguilla flag, orange or blue (a nice bright aqua in this case). I met some very nice people there, both working the market and browsing the market. Another highlight of the day was the visit from St. Barths school children. They spent the morning learning about and touring the boats TRADITION and Scaramouche. The children arrived and sat orderly on the wharf where they got an overview from Captain Laurie of TRADITION. 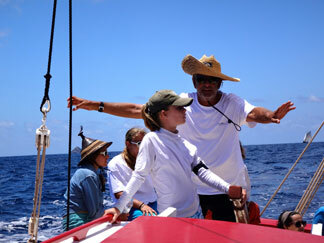 Then they lined up and Tradition's crew helped them board the bright, clean red boat. Once aboard some additional fundamentals of the boat were pointed out. 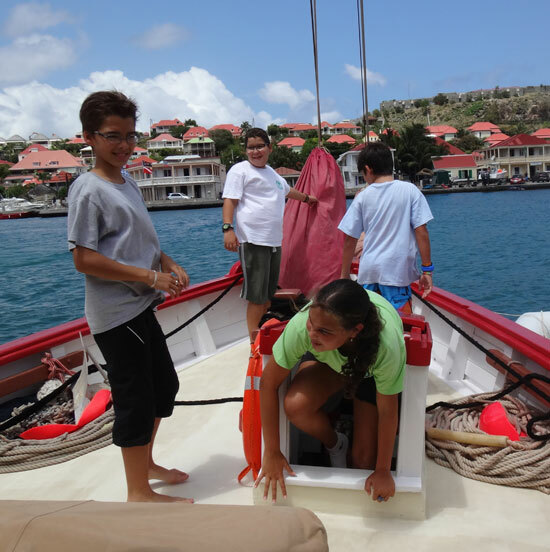 The students had plenty of time to explore, ask questions and learn more about Tradition and the privilege of sailing. They loved taking turns using the ladder! Day three marked the first day of racing. That morning as we headed out of the apartment, I caught a rewarding glimpse of Tradition and the other participating boats from across the harbour. TRADITION and her racemates... ready for their first day of racing. Tradition is the red one in the middle. My purpose for the trip was to "man the market" and so I stayed put at the Artisanal market and Tradition's crew took to the sea. When they returned they reported a great day of sailing and once it was over, the evening was full of whimsical moments. One of the venues for the magical evening was Tradition's neighbor at the wharf - the magnificent schooner named Scaramouche. As we approached Scaramouche it started to rain. Shortly following there was a group of people parading toward us, willingly in the rain, mind you. One person had a guitar and they were all chanting simply that "it's raining" and "we're cold". Cold is a relative descriptor, as it was May in the Caribbean. If that sort of jolly, easy going, fun spirit doesn't give you an idea of the type of people attending the West Indies Regatta, you must experience it for yourself. 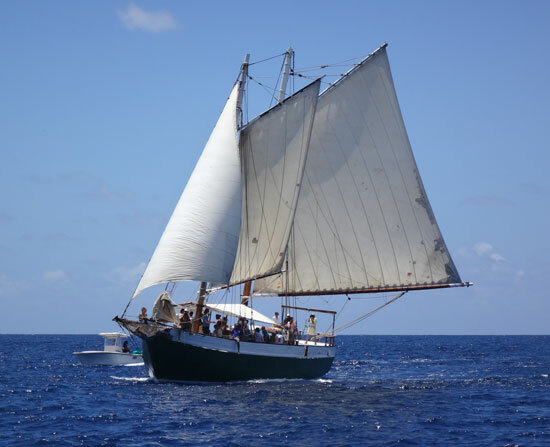 After taking in the happy parade of singers, we kicked off our flip flops, commonly called "slippers" in the Caribbean, and took the tall step up in to the charming, evergreen-painted, white-trimmed wood schooner - Scaramouche. Aboard the Scaramouche, which was used in the filming of Pirates of The Caribbean by the way, there was a man surrounded by children nestled in the safety netting around the bowsprit. It was a gorgeous site. I can only imagine if the man was sharing stories of the sea or of pirates. Simultaneously, the band called Revolution Sound System from Antigua had gathered midship and their lead singer's soothing, jazzy voice was filling the air. Others chimed in on familiar songs. It felt very impromptu and was a tremendous moment between the rain drizzling, boat gently rocking, fresh air and content faces. It was a dream-like evening and memorable, likely never to be recreated. I was really enjoying the West Indies Regatta and I hadn't even participated in the actual regatta yet...! This day marked the second and last day of racing. Since the market had closed, I got to come along for my first regatta racing experience on Tradition! From what I gathered, this regatta was not necessarily so much about competition but more so about getting together with those who have this common interest, appreciation and investment. I got to help out with the backstay. Aboard we had the crew of Tradition, myself, a few new friends who live in St. Barths (one of which was the amazing accordion player! ), an additional competition-experienced sailor, friends of Captain Laurie's family - Captain Roman Biel and his daughter of St. Barths and last but not least, a young girl and a young boy from the St. Barths Sailing School. The different classes set out for their start of the race. 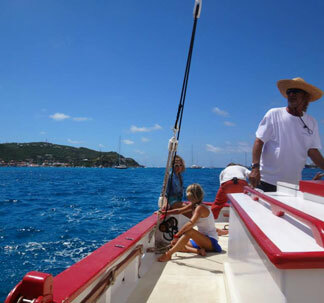 We made our way out to the northwest and north, sailing closer to St. Martin and around and between the exposed rock and land that is staggered around the sea entry in to Gustavia. It was extremely beautiful and dream-like. 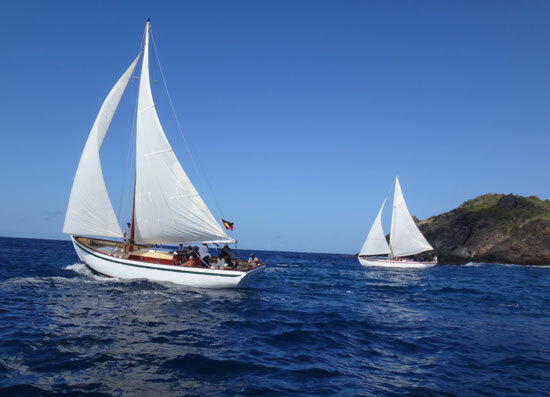 Not only was the scenery of wooden boats all at sea a spectacular sight, so was the landscape of St. Barths and the camaraderie aboard and between boats was as it should be. Considering the work that must be accomplished in a correct and timely fashion in order to keep the boat sailing properly, the Captain of Tradition was consistently gentle and polite in his requests of the crew - whether seasoned or not. Tremendous teamwork, it was. I even got to have a duty on Tradition that day... the backstay. 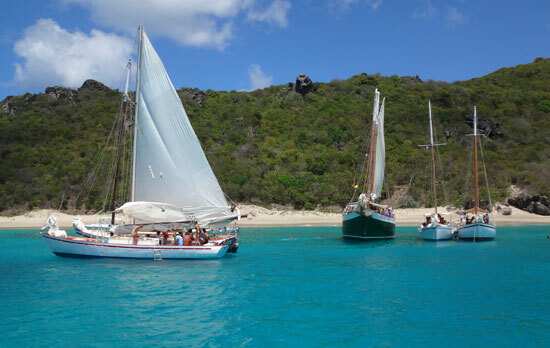 Lunch break brought all of the boats to a rest in Anse a Colombier. This particular beach on St. Barths is not as easily accessed via land. I've heard it's a 30 minute hot hike. Although I haven't made the hike, I'd say it's worth it if you are unable visit this beach on a boat. It's a large, beautiful, turquoise blue bay with no visible businesses and we happily make our entrance via Tradition. Our lunch on board was a smorgasbord of delicious contributions including saltfish and johnnycakes. A few ti punch are had and some of us opted for a quick soak in the water. 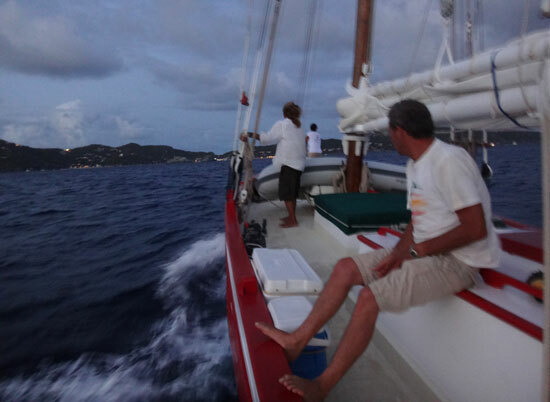 After that, we were off to race back toward Gustavia. The day was beautiful in every way. The weather, the sailing, the teamwork, the company, the food, the scenery and the reason for coming together in the first place. Upon settling back in to the harbor, that evening was the awards and recognition ceremony aboard Scaramouche. The gathering was celebratory. The ceremony was full of support and admiration for the shared interest in the purpose for the West Indies Regatta - to keep Caribbean boat building alive. These are the people who are helping to keep it alive. Congratulations were in order to many people for a variety of achievements. The St. Barths Tourist Board was present and spoke, solidifying my good impressions of their involvement in such an important but not necessarily initially lucrative endeavor. Following the congratulatory words and applause the group dispersed as we were to meet up across the island at Baie de Saint Jean's La Plage restaurant at for dinner and goodbyes. 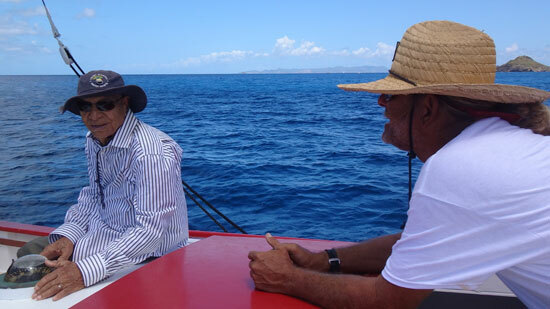 It had been a memorable time with good people brought together by a shared love and determination to keep the important tradition of West Indian boatbuilding.